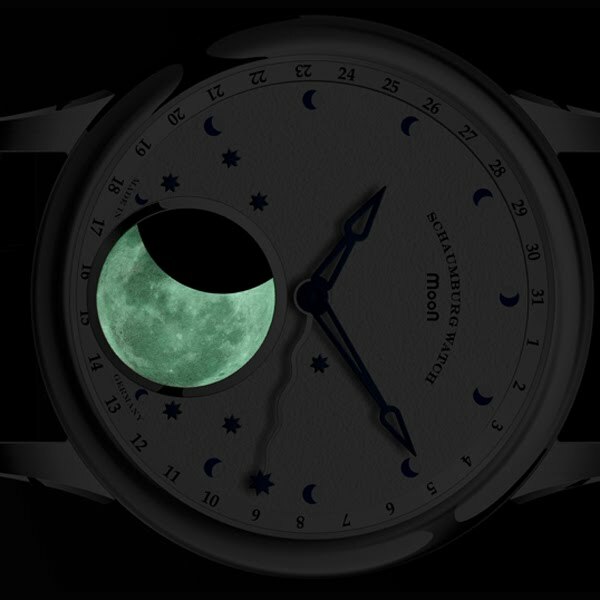 The MooN is a mechanical high-tech lunar-phase-watch of the superlative. It´s display is luminesce, patented and depicts the lunar cycle of the northern and southern hemisphere realistic like a photograph with a maximum divergence of only one day in 122,5 years. For a complete Astron rotation the moon needs siderisch 27,3217 and synodisch 29,52 days. A simple lunar-phase-watch measures one moon cycle with 275 days. To keep the lunar-phase-watch precise a very complicated wheel work is needed. Analogous to the daily divergence of the moonrises, low and high tide daily occur about 50 minutes later. Spring tide at times of full and new moon show how enormous powers the moon has on the earth´s water supplies. The phases of the moon have sustainable influence on our lifes. But in our modern life we are far away from living according to the natural light and tide rhythms, so that we need a lunar-phase-watch to become aware of the current phase of the moon. 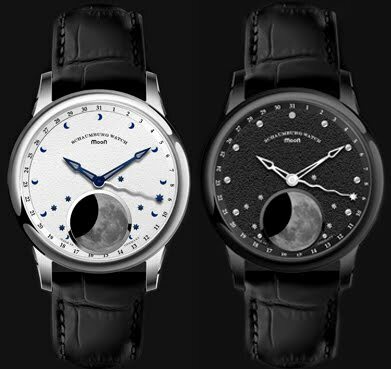 Therefore lunar-watches and moon calenders are having a recent renaissance.The drawback of most lunar phase watches is their imprecision, only a very few highly expensive watches ar precise for decades. 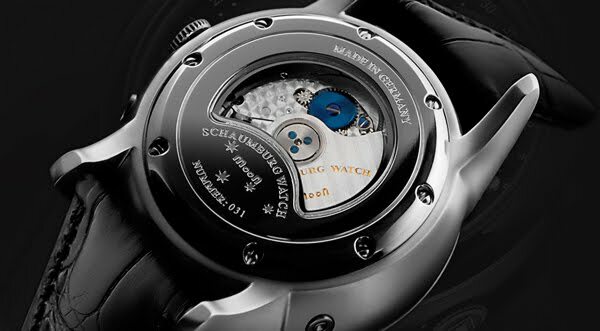 The phases of the moon have always been a topic for Schaumburg Watch: Our aim was to integrate a most realistic lunar-phase-chronometer with most precise functionality into a wrist watch. The fotorealistic depiction of the MooN with its 13,4 mm is ought to be the world´s biggest lunar-phase-chronometer that you can find in an automatic watch. Thereby not the depiction of the moon itself moves but the simulation of the earth shadow. Therefore the moon stays visible like in a starlit night even when it is new moon. During full moon its small image on the display shines like its big paragon because of the Superluminova A-Grade luminous mass. 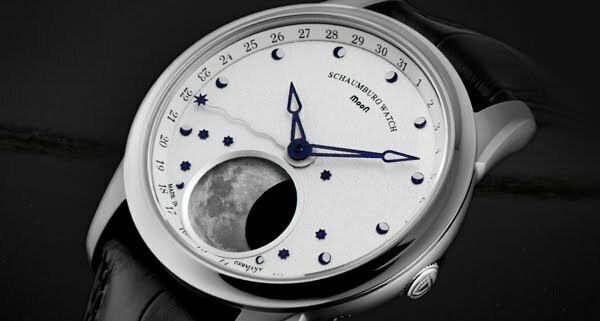 A further superlative that was developed by Schaumburg Watch is the choice to order the MooN with the lunar phase on the right or left side for the northern or southern hemisphere. This self-development is based on an innovative minute wheel system that allows to deliver the model with the lunar phase depicted on the right or left side according to the latitude. Another highlight is the almost absolut precision of the lunar-phase-chronometer. Only in 122,5 years the depicted moon cycle differs from the real one just one day. Equally important as the decade long precision of the chronometer we considered the up-to-the-minute adjustment of the lunar phase on the clock face. The correction button near eight o´clock allows a minutely detailed rotation of the shadow of the earth above the moon, so that a full moon can be exactely adjusted to 10.05pm. Due to such cunning movement-technique we installed a steel case suitable for daily use instead of a standard case - its well-designed form already causes enthusiasm. The 43mm sized and very massive case is conical at the bottom and has well-formed lugs for 22mm straps. As a special highlight we designed the bezel in the form of a crescent moon which also protects it from scratches. Also the form of the lugs is very unique and increases the recognition value of the sportive and elegant watch in current size.